Wonder Wafers “Super Singles” are individually wrapped and perfect for individuals who just want a few Wonder Wafers at a low cost. Each "Super Single" is Factory Direct Fresh and Sealed to keep that amazing aroma until you are ready to use them. We’ve been selling Wonder Wafers at our car wash for a long time. They sell REALLY FAST and our customers love them. Some customer stop by our car wash just to purchase Wonder Wafers. 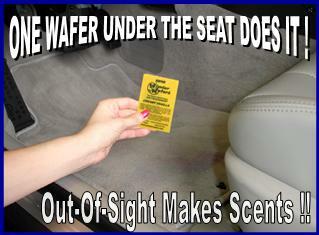 We use these wonder wafers in all our used cars when detailing them. They are the best air freshener we have found to date. We use nu car, new leather, clean car, and black royale in our used cars. They are not overpowering, and have a uniform smell throughout the car. Q: Where can I purchase these wafers? A: You can purchase them online from us, or most full service Car Washes carry them as well. Q: how long are they estimated to last? A: Our individually wrapped Wonder Wafers will last an extremely long time while in their packaging. Once taken out of their wrapper atomization starts, and they will last a week or more in a car. Their life expectancy is very much dependent on the application, fragrance type, ambient temperatures, ventilation, and an individual's olfactory sensors. Some fragrances will seem to last longer to some people, while the same fragrance will seem to weaken to another person.